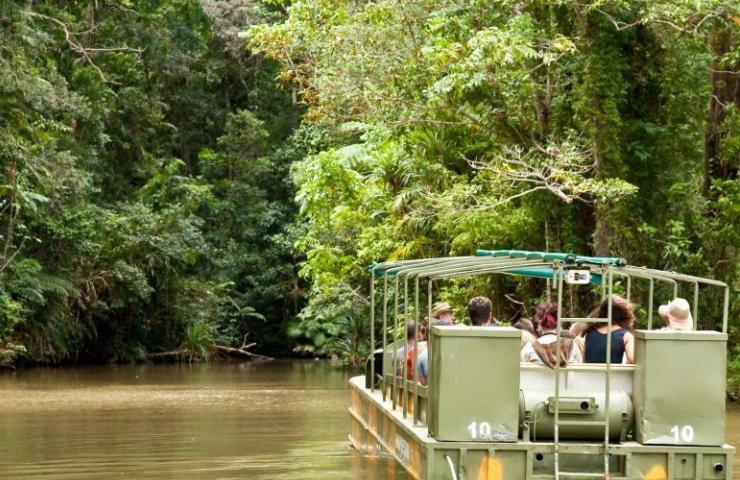 Daintree is nature's kingdom, a gem in Australia's crown of natural icons, where the world oldest rainforest meets the Great Barrier Reef. Fan palms, flying paradise kingfishers, tree frogs, butterflies of every hue and colour, rainbow lorikeets, and entwining strangler figs enhance the beauty of the area. Rampant climbing vines set by crystal streams flow into the tropical sea. The remote natural magnificence of Cape Tribulation and Daintree Wet Tropics is far from the glitz of civilization and brings both awe and peace - a true solace to the soul. Free afternoon to explore Cape Tribulation or book some optional extra activities. Ask us about these options. All Twin Share accommodation requires 2 adults. If just 1 adult the Single Share needs to be selected. This tour picks up from Cairns, Northern Beaches & Port Douglas accommodations. Spend the afternoon with free time exploring Cape Tribulation or book some optional extra activities. Ask us about these activities.